The reduction in Scotland’s drink-driving limit has had little effect on the level of deaths and accidents on the nation’s roads, according to a new study. 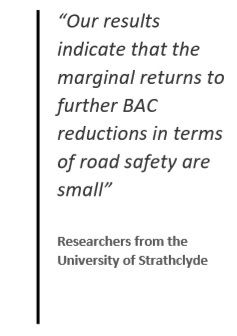 Researchers from the University of Strathclyde found that the lower limit for blood alcohol content (BAC) has not been followed by a statistically significant overall drop in road fatalities, including during peak collision periods at night-time and weekends. There has also been little change in the death rate for young drivers aged 16-25 years, who are seen as one of the highest-risk groups for drink-driving. The lower drink-drive limit of 50mg in every 100ml of blood was introduced in December 2014, bringing Scotland into line with most other European countries. However, the rest of the UK still maintains an 80mg per 100ml limit. The study, carried out by the university’s Department of Economics, assessed data on more than 1.1m collisions between 2009 and 2016 – leading to 1.5m casualties and more than 14,000 fatalities – with prevailing weather conditions also taken into account. The study found that, in the two years leading up to the lower BAC limit, Scotland had a monthly accident rate of 740.63 and fatality rate of 14.96. 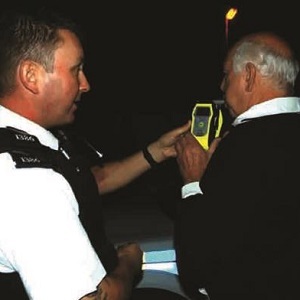 In the two years after the new limit was introduced, the rates were 704.13 for accidents and 15.25 for fatalities – consistent with England and Wales, where the BAC limit remained unchanged. Furthermore, the change in policy did not ‘appreciably affect overall accident rates’, which increased by 0.18 accidents per 100,000 of population – although this is described by the researchers as not statistically significant. The researchers say: “While there may be other reasons to pursue a reduction in the BAC limits, our results suggest that this further BAC limit reductions has not achieved all that might have been hoped for it in terms of road safety.